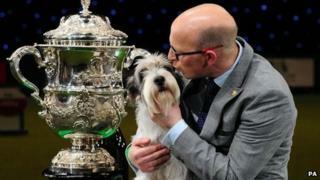 A Petit Basset Griffon Vendeen nicknamed Jilly has been crowned Best in Show at Crufts. The four-year old, full name Soletrader Peek A Boo, beat more than 20,000 dogs to take the coveted title. The canine - owned by Sara and Gavin Robertson from Wallingford, Oxfordshire - vied for the title along with seven dogs after winning Best of Breed and then Best in Group in previous rounds. The four-day competition was held at the NEC in Birmingham. Judges from the Kennel Club mark the dogs according to the criteria of their individual breed standards. They also assess the dogs' overall health and condition, coat, character, temperament and movement. The reserve Best in Show title went to a three-year-old Labrador Retriever called Romeo from Cesara in Italy.